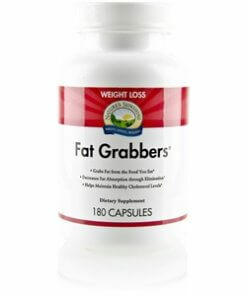 Fat Grabbers by Nature’s Sunshine are capsules designed to decrease the absorption of fat in the body. It may also help maintain healthy cholesterol levels that are already normal. Nature’s Sunshine conducted laboratory research that verifies the results of many other studies showing saponins and lecithin work to emulsify fat when in water. This means that this product may assist in the breakdown of fat in the body. Guar gum and psyllium hulls work to bind the broken down fat which is then eliminated from the body as waste material. 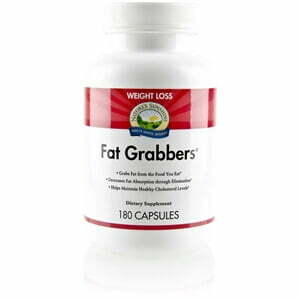 Using Fat Grabbers capsules–along with a healthy diet and exercise plan–may assist in effective weight management. This product contains all natural ingredients and two different kinds of fiber. It contains no dangerous stimulants, only wholesome ingredients that are safe and gentle on the body. All the ingredients in this formula are safe and effective. Instructions: Take four capsules with a meal three times daily.